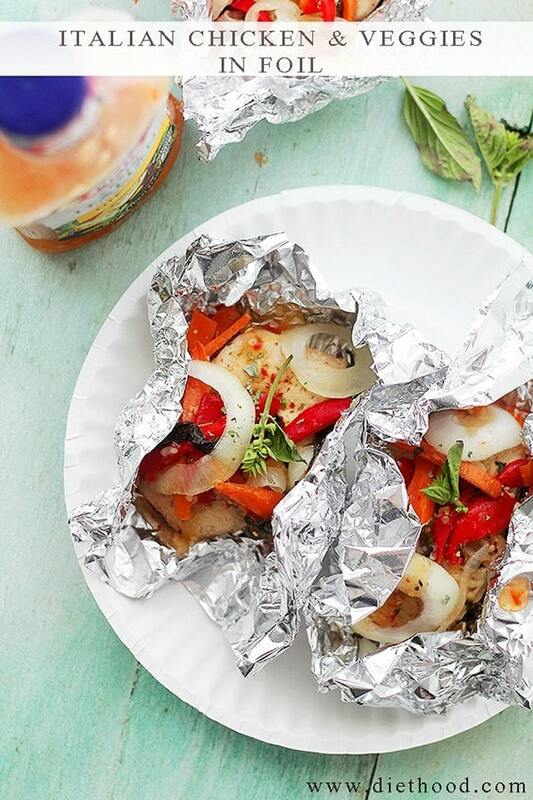 My family discovered foil packet dinners this summer while cooking out, and they became a hit for everybody from a two-year old to the adults (but seriously, who are we kidding calling ourselves adults?). 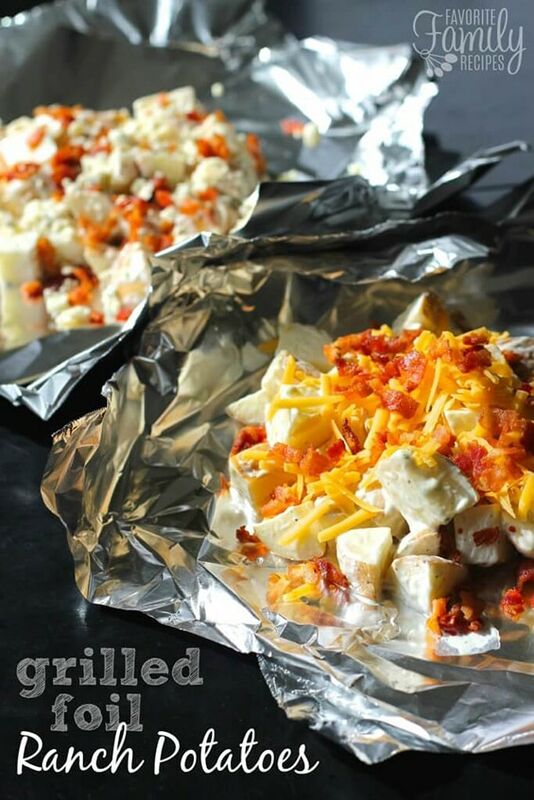 Mixing up favorite ingredients in a tin foil pouch and cooking over fire was both fun and rewarding – and not to mention quick and easy! 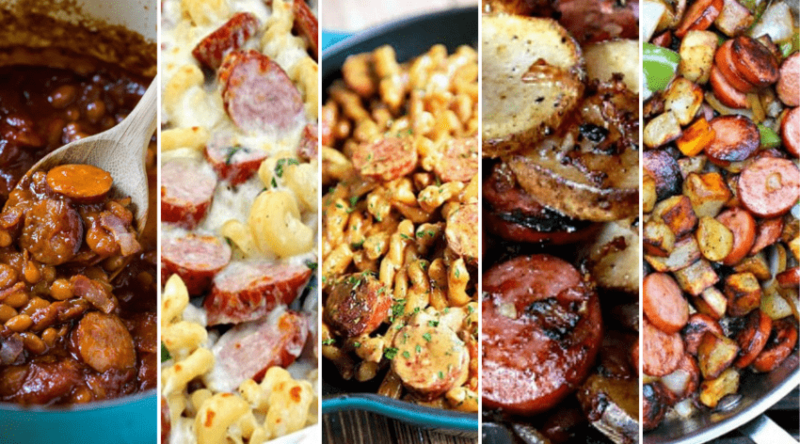 These meals became not only popular due to flavor, but for how simply they came together after a long day of play! And did I mention there is little to no cleanup? Campfire cookouts and BBQ pits have influenced a love of outdoor summer cooking, and with summer rolling to a close I’m already missing the mixed flavors of proteins and fresh veggies all cooked together over an open flame. Or am I? What I have decided I love best about these recipes is: you can carry on the tin foil packet habit year-round in your oven! I had to try it out to see if it tasted the same, and since all the flavors are immersed into a small space, they infuse each other with flavor just as well in an oven than they do outdoors. So we may miss the ambiance of outdoor cooking for a few months, but at least we don’t have to give up on our favorite recipes! In a blender, combine onions, garlic, coconut, lime zest, lime juice, cilantro, olive oil and soy sauce; blend until smooth. Place marinade and shrimp in a resealable bag and toss to coat. Place in the fridge for 2 to 4 hours. 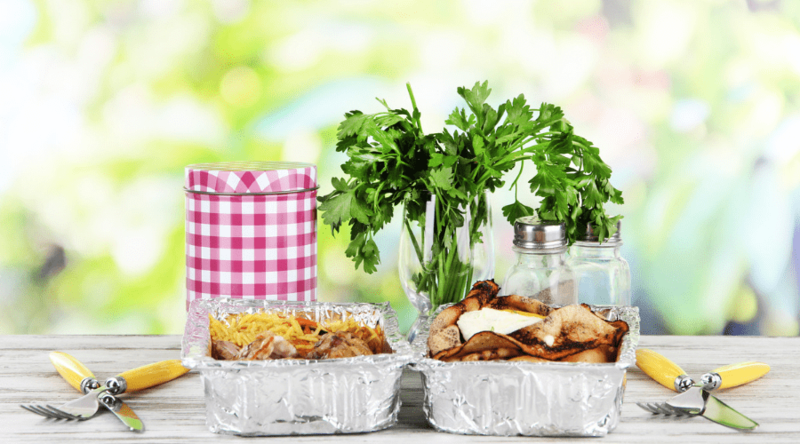 For each foil pack, prepare two sheets of aluminum foil; place the sheets one on top of the other for durability and lightly spray with cooking spray. 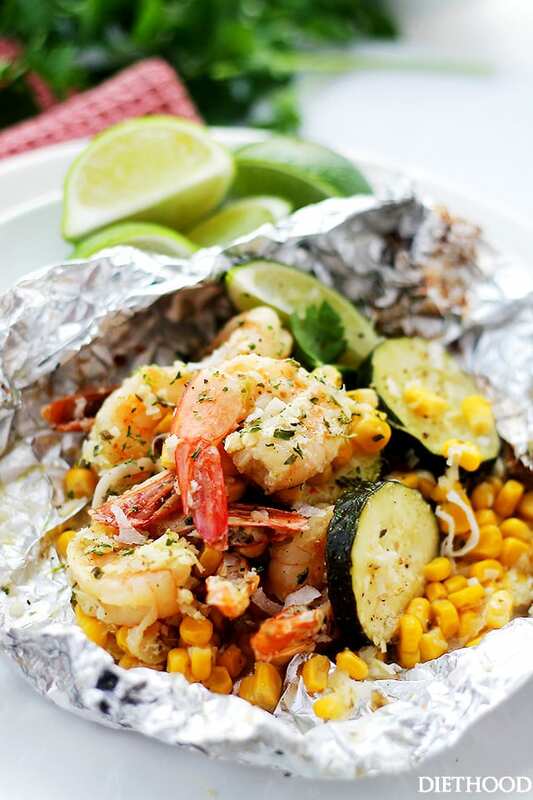 Divide up the veggies and shrimp evenly and place into the center of each foil packet. Carefully open the foil packets and stir the contents. Salmon is a staple in my household. We like it poached, broiled, baked, grilled and over rice, in salads, or just on it’s own with a slice of lemon. This zero clean-up recipe creates a perfectly seasoned, savory steamed salmon perfect to serve with your favorite side! Spoon the butter mixture over the salmon. Fold the sides of the foil over the salmon, covering completely and sealing the packet closed. Asparagus and tomatoes pair perfectly with this catch of the day. Though the recipe calls for tilapia, any filleted fish will work equally well. Add a bit of lemon, a dash of salt, and uncork that white wine- because you now have a simple, easy, and elegant meal to end your night with. Preheat oven to 375 degrees F. Tear off two 2-foot-long sheets of aluminum foil. In a small bowl, mix together olive oil, chili sauce, and 1/4 tsp. kosher salt. Place asparagus spears down the center of each piece of foil, and lay sliced tomato evenly on top. Sprinkle with a couple pinches of kosher salt. Place one fish fillet on top of tomatoes in each packet, and spread fish with olive oil mixture. Arrange lemon slices over the fish. Fold the two long sides of foil to the center and fold to make a seam. Crimp the short ends to seal the packet completely. Place sealed packets on a baking sheet, and bake in preheated oven for 25-30 minutes. Very carefully open one end of each packet and pour off any excess liquid before opening fully. Be careful because there will be a lot of steam! Open packet, and slide spatula under the entire fish/tomato/asparagus assembly to transfer to serving plate. It’s dinnertime with this Italian chicken and vegetable mix-up that is sure to get your taste buds watering. 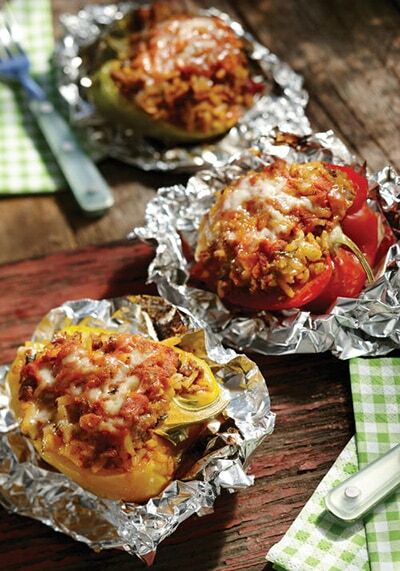 This nutritious meal is a snap to throw together, literally, into a foil packet, bake for 30-40 minutes, and serve up to a hungry family any night of the week. 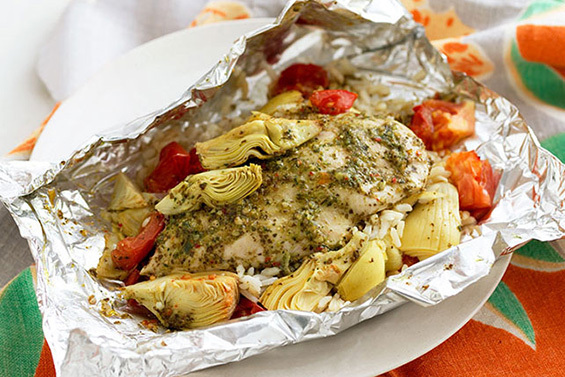 4 aluminum foil sheets, large enough to wrap around one chicken breast. 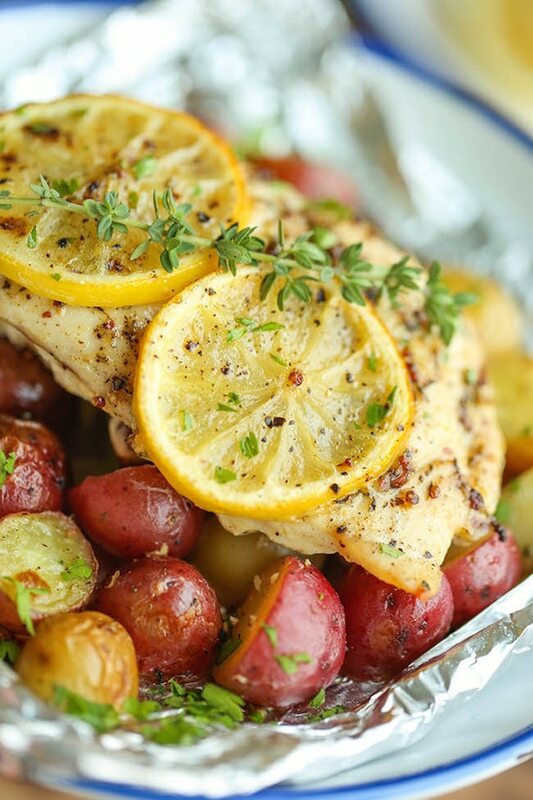 Place one chicken breast on each sheet of foil. Drizzle a teaspoon of olive oil over each chicken breast. Season chicken with salt and fresh ground pepper. Arrange chopped garlic, slices of onion, peppers, and carrots on top and around each chicken breast. Place a basil leaf on top of each chicken and vegetables. Spoon 1 to 2 tablespoons of salad dressing over chicken and vegetables. Transfer foil packets to a baking sheet. Looking for a light, fresh and tender take on your grilled garden favorites? This mix of flavors is pure veggie perfection and can serve as a main course all on it’s own. Looking for a light protein to mix in? Try some baby shrimp, cubed tender steak, or a shredded chicken served over rice for a more filling entree. Preheat grill to medium. Cut 6 12-by-18-inch pieces of heavy-duty foil. In a large bowl, whisk oil, vinegar, garlic, seasoned salt and pepper. Add vegetables; toss to coat. Divide vegetables evenly among foil pieces. Drizzle with any remaining dressing. Place packets, seam side up, on grill. Close grill and cook for 20 minutes. 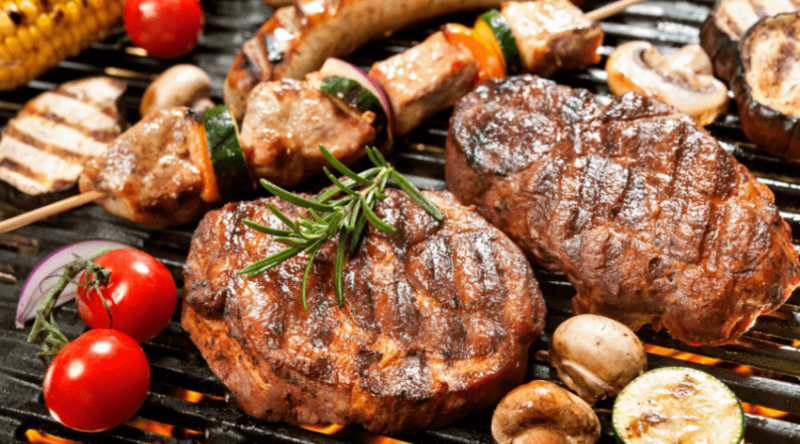 To check for doneness, remove one packet from grill, open carefully and taste a vegetable: It should be crisp-tender. Carefully open packets and serve. Stuffed peppers are a popular dish around here, but I often avoid making them because I have to scrub out the pan afterwards due to runny juices, caramelized vegetable, and baked on spilled cheese. Solution? I think so! Why not wrap them in foil to keep them stable AND to contain any juicy runover? Meanwhile, in a medium saucepan, bring 1.5 cups water to a boil over high heat. Stir in rice. Reduce heat to medium-low, cover and simmer for 5 minutes. Remove from heat and let stand for 5 minutes, then stir in beef, zucchini, Italian seasoning, 1 cup spaghetti sauce and 1 cup cheese. 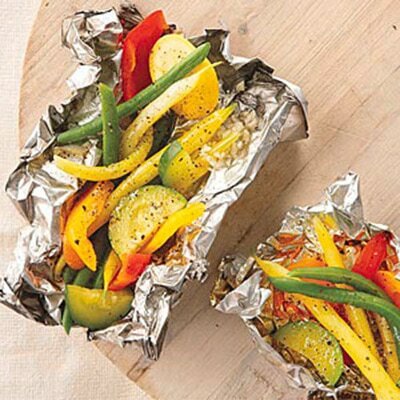 Place a pepper half on each prepared foil sheet. Spoon beef mixture into pepper halves, dividing evenly and top with the remaining sauce and cheese. Fold edges of foil up into a bowl shape around the pepper. Spoon 1 tablespoon water into the bottom of each packet. 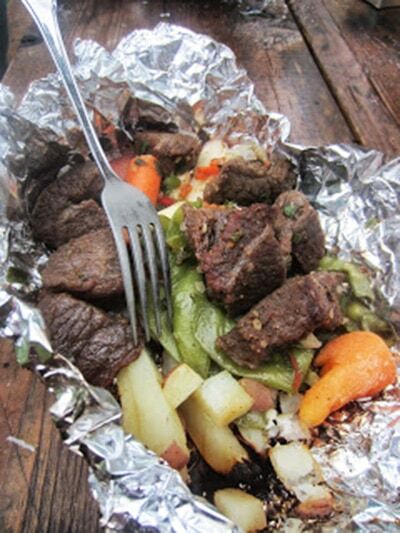 Fold foil into tent-style packets and seal edges tightly. Refrigerate for up to 3 days. Prepare campfire coals. Place packets on hot coals and cook for 20 to 25 minutes or until filling is heated through and peppers are tender and the edges are crisp. Let’s face it, potatoes are good anytime, anywhere, and in pretty much cooked up anyway. Want some served with a side of ranch, cheese, and bacon? How about tossed up and grilled up all together into one, zesty, creamy mix to die for? Yes please! After potatoes are washed and cut, combine the ingredients for the ranch mix. Use just enough of the mix to thoroughly coat the potatoes and stir together in a large bowl. Then wrap the potatoes up in the foil so they are completely covered. We usually wrap each one in two pieces of foil. Who said the best cheesesteaks come from Philly? Why not try your nearest campfire (or in a pinch- your oven) rather than yearn for an unobtainable meal that is halfway across the country? 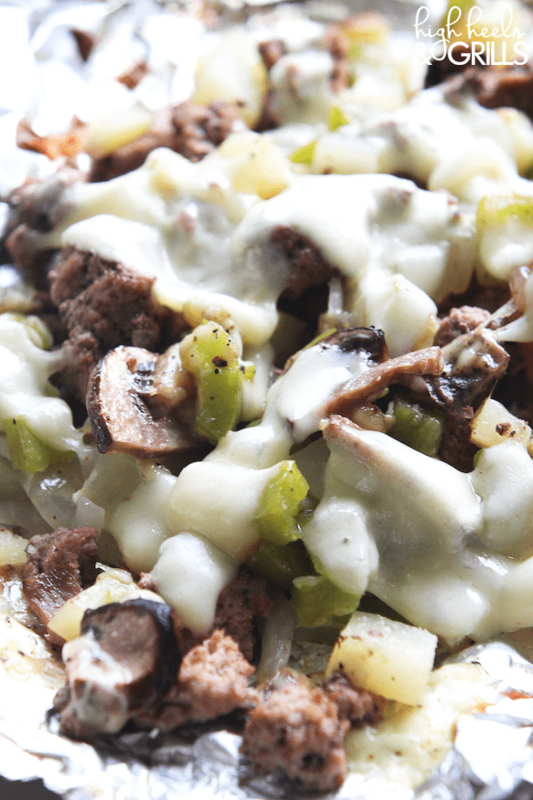 Try this recipe that combines all the ingredients you need, with all the flavors you crave, and top it with a hot melty cheese for your homemade philly fix. Place a nice ¼ lb layer of meat on a 14″ x 14″ square foil piece. You can do a solid patty of meat (the manly option), or disperse the meat into chunks (for women – or those with dentures). Place the packet on a cookie sheet and bake for about 20-25 minutes – no need to flip or double wrap. It is impossible for this recipe to get old. Ever. 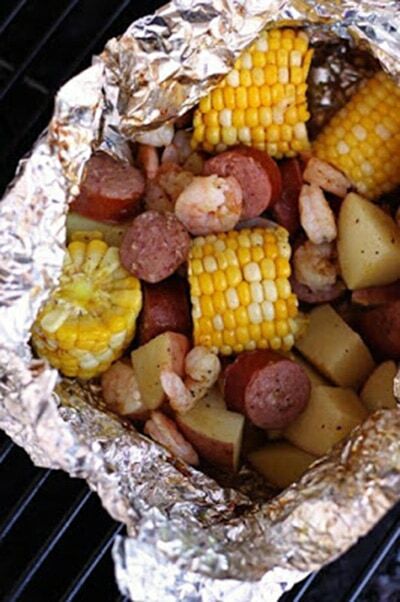 Smoked sausage, shrimp, corn, potatoes, and your choice of seasoning cooked up in a bed of butter and broth is sure to be the biggest hit to ever cross your dining room table. And did I mention that there is almost zero prep time? And next to no cleanup? 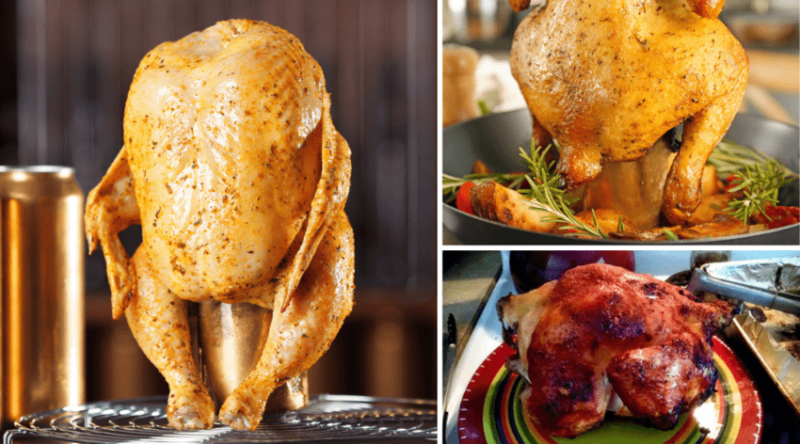 Chicken just is one of those meats that happens to perfectly take on the flavor of whatever extra goodness you choose to cook it alongside with. In this case, fresh rosemary and lemon showcase their flavors through this rich infusion that tastes like a million bucks. Ham, pineapples, sweet potatoes, and spicy red pepper flakes merge into a rich, delicious goodness in this quick grilled packet good for any occasion. Rich in healthy antioxidants and vitamins, the sweetness of the ingredients are perfectly tempered by the salty ham, and spicy peppers for a party in your mouth! Make a large double-layer of foil. Spray with non-stick cooking spray to keep things from sticking. 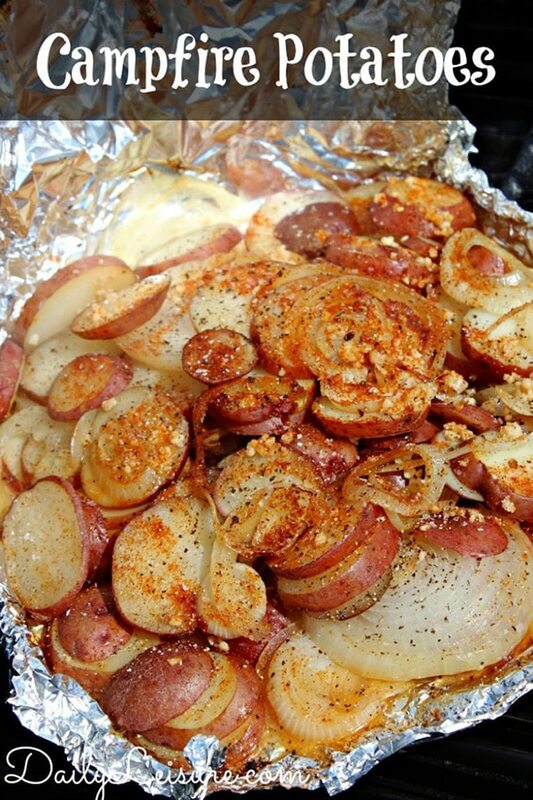 Place the potato chunks on the foil. 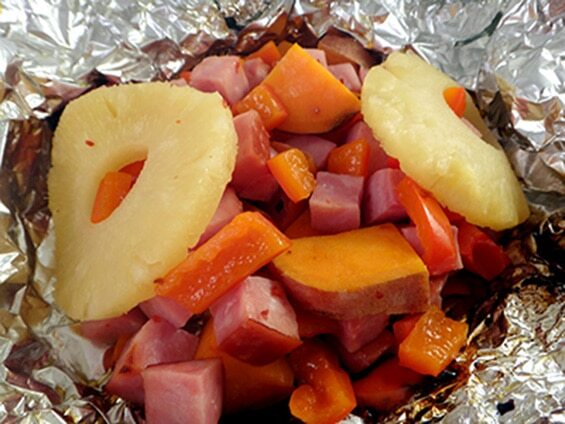 Layer ham, red bell peppers and pineapple on top of sweet potatoes. Place butter on top of ingredients. Sprinkle brown sugar over everything and top with pineapple juice. Sprinkle red pepper flakes to your desired spice level. Wrap and seal the aluminum foil. Leave room in the packet to allow air to flow through as it cooks. Cook on hot coals for 20 minutes, flip about half-way through. Cook until potatoes have softened. Open with caution – there will be lots of steam. Pot Roasts are good anytime of the year. That slowed cooked beef flavor, blended with carrots, onions, and potatoes, is a homestyle favorite world round – but can take all day to get it just right. Until now: Prepare these ingredients in advance, and toss together in a foil packet to steam themselves into tender perfection in no time. Place cloves of garlic and cut green onions into container. You can add other ingredients you’d like in the tin foil dinner, but I think it’s better to leave them out. Pour vinegar over meat. Wrap up and throw it in the fire! Leave it in the coals for 30 minutes then, if not finished, check every 5 or 10 minutes. Enjoy the meaty, hearty deliciousness! Chicken and broccoli, broccoli with chicken…no matter how you say it, it goes together like PB&J, and is just about as popular. 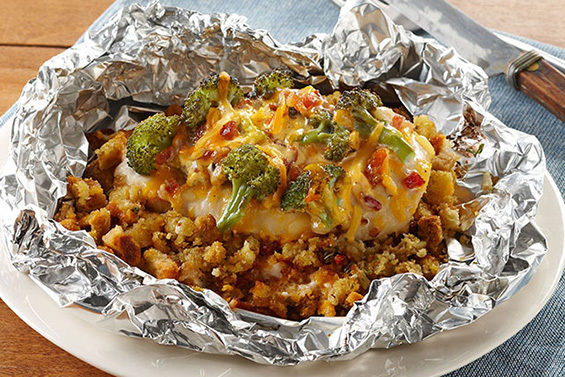 Try this zesty, cheesy take made up in an easy foil packet and done in only a half hour. Combine stuffing mix and water; spoon onto centers of 6 large sheets heavy-duty foil. Top with remaining ingredients; fold to make 6 packets. Place in single layer on rimmed baking sheet. Bake 30 to 35 min. or until chicken is done (165°F). Remove packets from oven; let stand 5 min. Cut slits in foil to release steam before opening packets. This simple chicken fajita dinner comes together with ease whether you are feeding just yourself or an entire party. Simply get together your traditional fajita ingredients all together in one place, and let those savory flavors blend together over an open flame, or in your oven for easy clean up! Fold up all sides of each of 4 large sheets heavy-duty foil to form 1-inch rim; spray with cooking spray. Combine rice, water and taco seasoning; spoon onto foil. Top with remaining ingredients. Bring up foil sides; fold to make 4 packets. Place in 15x10x1-inch pan. Let’s admit it, this isn’t the healthiest option to foil packet dinners, but it has to be one of the most satisfying. Frozen (or fresh) French fries, chili, cheese, and maybe a little onion marry in the perfect packet of flavor explosion. Be sure to cook up your fries a bit first before adding the rest of the ingredients and tossing back in the fire to get the crisp ‘tator taste! Spray the inside of a large doubled-up sheet of foil with cooking spray. Place the frozen fries in the middle of the sheet; fold to enclose. 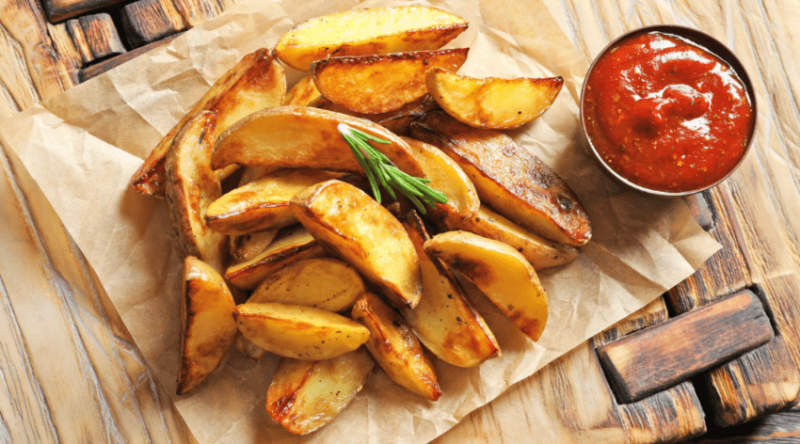 Cook the fries on your BBQ or over a campfire until they are cooked – around 15-20 minutes. 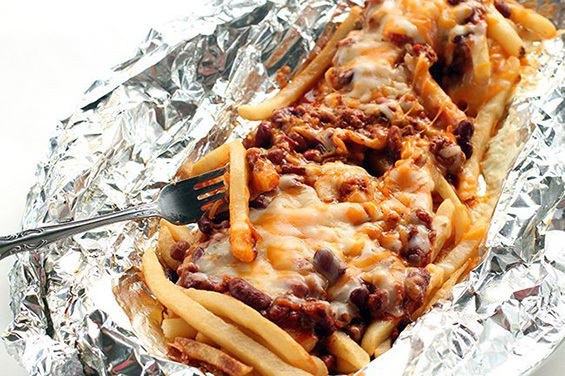 Spread the chili and cheese over the fries. Close the packet again and cook until the chili is hot and the cheese has melted. Remove, cool slightly and enjoy! We just ate it with forks right out of the package! I grew up thinking I didn’t like artichokes (I was picky), and boy did I find out later in life how right I was – I LOVE them! These artichoke hearts, tomatoes, blend of spices and skinless chicken come together for a healthy heart option that is just bursting with rich flavors. 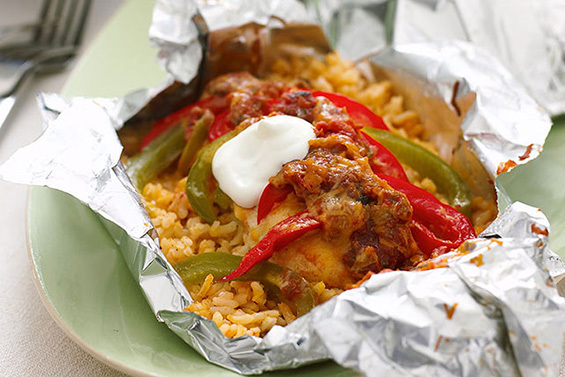 Mix rice and water; spoon onto centers of 6 large sheets heavy-duty foil. Top with chicken, artichokes and tomatoes; drizzle with combined dressing and pesto. Bake 30 to 35 min. or until chicken is done (165°F). Remove packets from oven; let stand 5 min. Cut slits in foil to release steam before opening. Probably because they got a stomach ache over the not being able to stop themselves from finishing off this gloriously easy, cinnamon and sugar recipe. Although the recipe calls for a dutch oven – forget about it. Just use a cheap disposable aluminum pan and line it with tinfoil. Then all you have to do is rip up refrigerated biscuit dough and toss it in cinnamon sugar before throwing it all together over the fire. 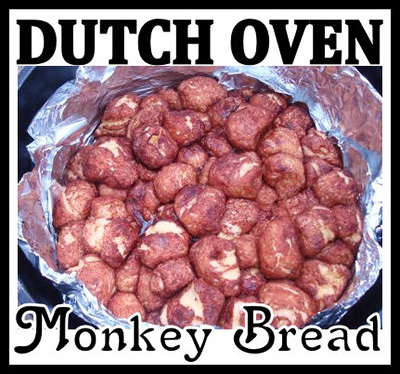 Cut-up biscuit doughs tossed in a sugar mix and baked in a Dutch oven or Pie Iron over hot campfire coals. It only takes about 25 – 30 minutes to cook, and should be eaten right out of the Dutch oven. Cut the biscuit dough and shake the bag to add a cinnamon sugar coating. Then let them toss them into the Dutch oven any way they want. This recipe is cooked with a Dutch oven, over medium campfire coals. I have a peach tree, and putting up peaches becomes a household duty come late summer every year. 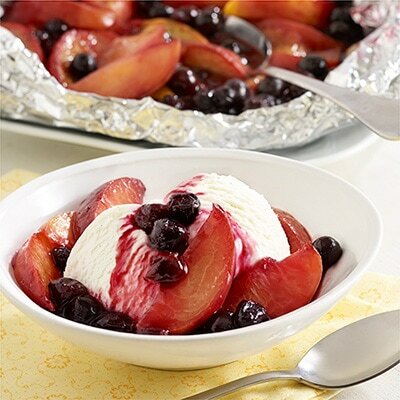 I don’t even think I need to say that recipes involving peaches are pretty popular around here as well, and when this recipe combined them with yet another of our fruity favorites- it quickly became a crowd favorite. 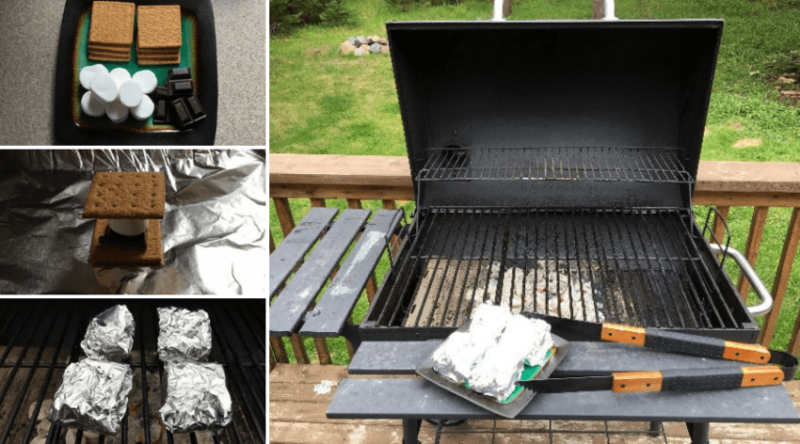 Preheat gas grill for medium heat. Meanwhile, combine peaches, blueberries, brown sugar, Parkay and nutmeg in medium bowl. Place one 18×18 piece of heavy aluminum foil on counter. Place fruit mixture in center of foil. Double fold top and ends of foil, leaving space for steam to gather. Place packet on grate; cover grill. Grill 15 minutes or until fruit is tender. Carefully open packet; serve warm fruit over ice cream. Having chickens usually results in a plethora of eggs that you need to get creative with. At least that’s how it works at my house. Luckily we also love breakfast foods at any time of the day, and so eggs become an important part of our regular recipes- however, for whatever reason they stick to a pan or dish like nothing else. 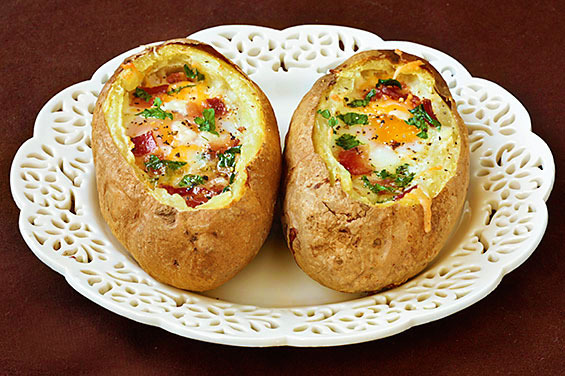 That’s why I love this egg and bacon in a potato bowl bake: not only do the eggs cook IN the potato, but in case of spillage, the tinfoil should take care of the problem. No more scrubbing for me! I recommend baking the potatoes until they are nearly done. You don’t want them to be underbaked, but then extra 20-25 minutes in the oven with the eggs will definitely continue to cook them, and you don’t want them to be overbaked. So I would err on the side of being mostly baked, but not completely. A Granny Smith apple, brown sugar, and cinnamon is all you need to make a simple, mouth-watering dessert to finish off your perfect evening. Top it with a little bit of ice cream for an extra burst of creamy sweetness. 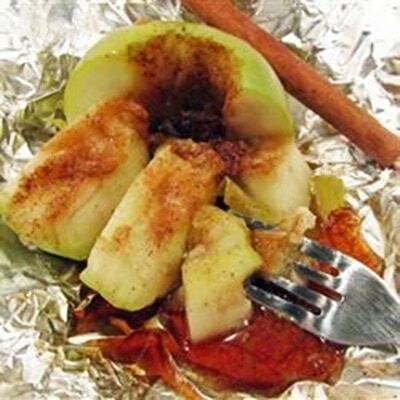 Fill the core of the apple with the brown sugar and cinnamon. Wrap the apple in a large piece of heavy foil, twisting the extra foil into a tail for a handle. Place the apple in the coals of a campfire or barbeque and let cook 5 to 10 minutes, until softened. Remove and unwrap, being careful of the hot sugar. When I think of potatoes on the grill, this is the recipe that comes to mind. Thin sliced potatoes with onions, garlic, worcestershire, and butter wrapped in foil and cooked up next to a nice, juicy steak over an open flame is how my daddy still makes them, and it’s a tradition that won’t die hard. .
Slice potatoes and onion into ⅛ – ¼” slices. Bananas. 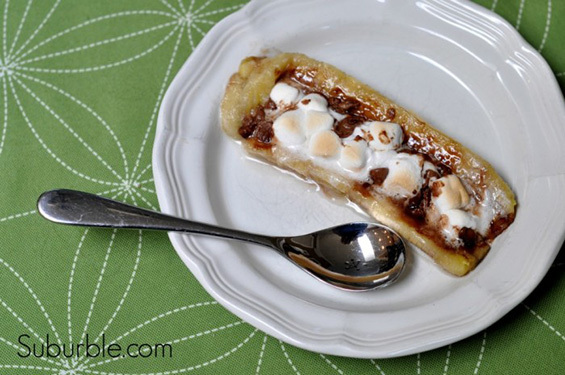 Bananas stuffed with chocolate AND marshmallows. On a grill. This might not be the prettiest presentation once the ooey, gooey goodness has melted in a yummy mess – but it sure is good! Put a banana on a sheet of heavy duty aluminum foil (or two sheets of regular-weight foil). Slice it down the center. Jam-pack it full of marshmallows and chocolate chips. The kids can handle this “assembly” quite easily. (Also, consider butterscotch chips). Wrap the now-stuffed banana with tin foil and put it on the coals of a campfire or on the barbecue. If you’re at home, you can put it in the oven at 400 degrees. Open your foil packet of goodness and be amazed at the sight of melted chocolate and marshmallow (all snug in their boat made of banana). Grab a spoon and dig in! Oranges and cinnamon are another one of those eclectic flavor combos that shouldn’t be parted for too long from your rotation of recipes. This little gem of a recipe includes both in a warm cinnamon roll baked up inside an orange rind, leaving behind a slightly acidic zing, and aromatic scent of orange infusion into the dough as it bakes. Hollowed out our oranges. Cut a 2 ” circle out of the top and then used a spoon to scoop out the orange. Filled a bowl with the orange flesh. 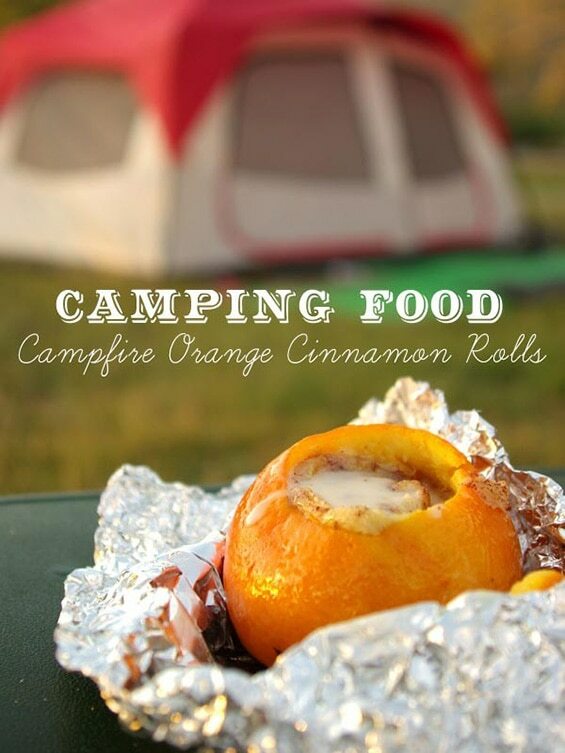 Simply stuck one cinnamon roll in each orange, put the cap back on, and then wrapped them in foil. Wrapped from the bottom up, so that the excess foil could be bunched up into a little handle. Put to right into the coals. Took about 12 mins to bake, but it really depends out your fire. Put a little drizzle of the frosting included in the can on top of the cinnamon roll. I’ve changed my mind about why I love these recipes, I think what I like best is that you can make as little, or as much, as you like. Quick meal for one? No problem! Feeding a crew? Equally as easy! Coming in a close second is how little prep, AND cleanup these recipes take to make year-round. Let me reiterate: little to NO cleanup. Which was your favorite? Or can’t you choose? Let us know below how your tin foil genius turns out. Have a question or comment? We want to hear! And as always, if you love it, share it!